I'm still plugging away at the Beatnik. I have finished the back and the sleeves, and both are currently blocking in the living room on my yoga mat. Though there is acrylic in the yarn, I've had good luck so far blocking wool/acrylic blends my soaking them in cold water for 10 minutes completely submerged, rolling them up in a towel to get rid of any excess water, and then pinning them. I still haven't gotten around to picking up actual blocking materials, and when I look at the prices of some I decide I'm not in any rush to. Yoga mats and sewing pins have worked just fine so far and I've no complaints. I lengthened the sleeves to make them full length. I've also officially decided to turn this sweater into a cardigan, and I've finished the left front so far. 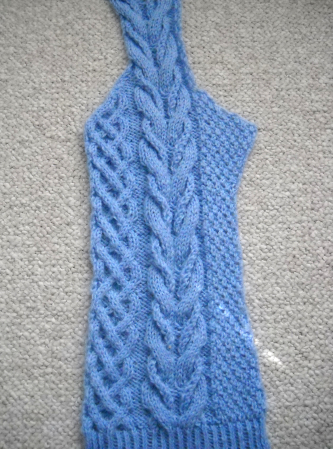 I don't want to show you all a picture yet because I'm not entirely sure if I like the cable variation I used. We'll see how it turns out. I hope to be finished by next week. I've also been working on the Beatnik and I have been really struggling with making the seaming look good with the seed stitch. Hopefully all that work will be worth it and we will both have beautiful new sweaters (or cardigans) to enjoy! Your sweater looks really great so far! That blue is one of my favorite colors. I'm sure it wil look lovely when it's finished! I'm working on a sweater as well. 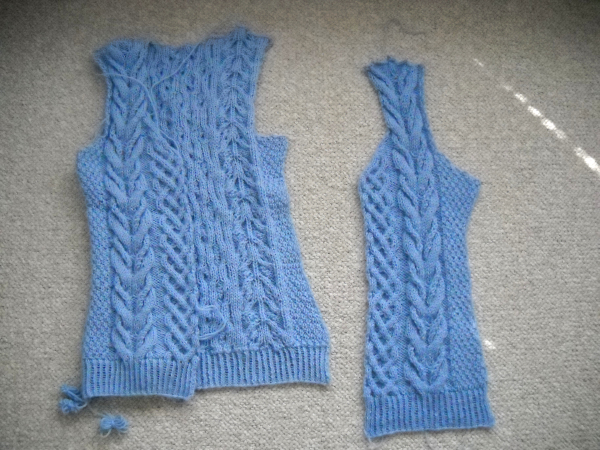 It's going nicely, except for the raglan sleeves. There is a tiny bit of errata in the pattern, and now I'm going to have my third time at knitting the raglan. Hopefully all will work out this time!